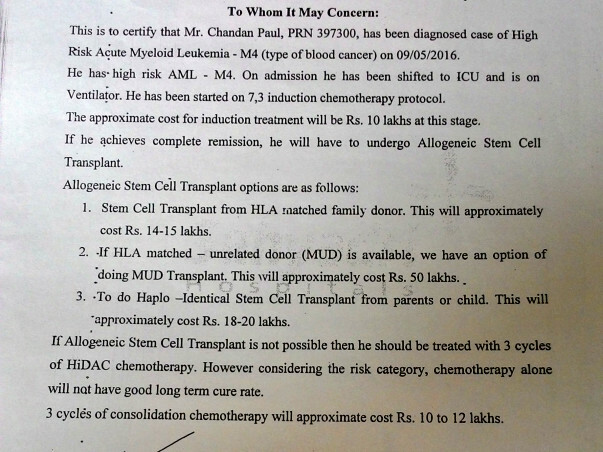 Chandan Needs Your Help To Fight Blood Cancer. Imagine the plight of a wife who discovers her 33-year-old husband has cancer when she is on a 2nd opinion consultation with the doctor for a body ache and mild fever. Preti (wife of Chandan) journey of accepting her husband's cancer is heartbreaking and makes us wonder how people find strength in such tough situations. And little angle Thishna 6 year old daughter unable to understand the what is this all about, she is only waiting for her father to be back with her in normal life to play with her. For housewife of single family earner, this situation is very tough to pass through, where on initial tests and treatment of 2-3 days of hospital admission, exhaust all saving and assets accumulated since marriage. Post which the relatives, dear ones and inner circle of society come forward with open heart to help financially. But this too is funding support for 12-17 days of hospital admission. Current situation of Priti is this, where she had exhausted all possible known source of financial help and this is just 1st stage of treatment after going through the trauma of knowing her husband is suffering from Blood Cancer. Now various stages of treatment like 2nd chemo and Bone Marrow Transplantation(BMT) yet to face. On 25th May was the 16th day of 1st Chemo. She had spent around 7 lakhs which she could collect. Estimate of treatment provided by hospital is 35-50 lakhs (depending on BMT match). Good hope news for her is 14th day bone marrow test had good reports. Next milestone is to secure Chandan till day 21st -24th day of chemo as currently the immunity level of Chandan is almost nil till from day 21st he starts strengthening his own immunity power. Further is 28th day bone marrow test results, and many more milestone still to face and achieve. The fight came to an end yesterday (28.05.2016 4:30 p.m) when our beloved Chandan demised leaving behind her wife (Preti) and 5 year daughter (Thikshna). Words can't describe the sorrow of his family. For both of them to overcome this loss is literally impossible, along with 100 percent financial resources exhausted for the treatment this is going to be so very tough. 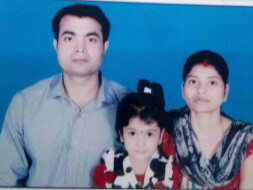 We are taking this campaign ahead, now to support "Help Chandan's Family". Where we are going to aid financially to Chandan's family, so that the mother can atleast secure her only hope (Thikshna) future. Today is Chandan's day 17, till yesterday his WBC count was 200 which means his immunity was low. He was having fever at night (not a good sign), but as of today his WBC count has gone up to 300 and also platelets have improved. We continue to pray for his recovery. But funding is a major roadblock now as we have exhausted every source.